Here's an update on a new article I published today on Triple Pundit on Allstate's achievement to cut its paper use internally by 41 percent and externally (customer focused reductions by eliminating unnecessary customer bill documents for example) by 12 percent, saving not just many trees but also a lot of money! The insurance company Allstate uses a lot of paper – in 2009 it used approximately 3.7 billion sheets, equal to approximately 450,000 trees. So it’s not surprising that the company identified paper reduction as one of its top environmental priorities, setting a goal of reducing overall office paper use by 25 percent by 2010. 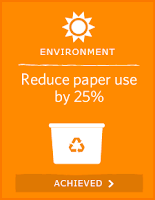 In their latest CSR report, which was released earlier this week, Allstate is revealing that it actually did much better, reducing its office paper use last year by 41 percent.